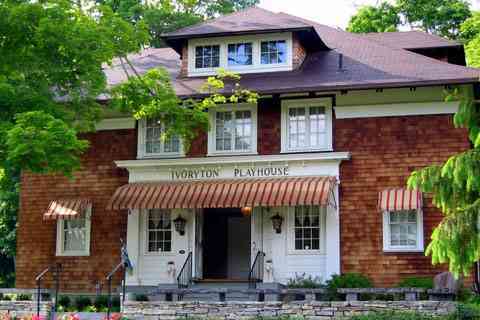 The Ivoryton Playhouse is located in Ivoryton, a beautiful section of historic Essex, on the banks of the Connecticut River. The Playhouse has been an important part of Connecticut’s cultural landscape for over 100 years. It was one of America’s leading summer showplaces, presenting a parade of stars such as Katharine Hepburn, Marlon Brando, Tallulah Bankhead, Betty Grable, Mae West and many, many more. Over the course of the past 30 years, the Ivoryton Playhouse Foundation has completed a total renovation of the building, including new shingles, a new heating and air-conditioning system, new seats and state-of-the-art theatrical sound and lighting systems. The building is now prepared to face the second century of its life. Since 2006, under the Artistic Direction of Jacqueline Hubbard, the Foundation began producing a year round season of professional theatre. Today, the theatre produces seven professional shows annually, drawing audiences from New York and New Jersey to Massachusetts. The 280 seat theatre is comfortable and air-conditioned and conveniently located off the highway close to several other desireable tourist destinations including Gilette Castle, The Connecticut River Museum, Essex Steam Train and two major factory outlet shopping centers.